Education Founded in 1955, the Faculty of Pharmacy offers degree programmes on undergraduate (M.Sc., Dr. Pharm), postgraduate and Ph.D. levels. It is the only pharmaceutical faculty in the world to offer education in three languages. The Hungarian, English and German programmes provide students with knowledge that is recognised and has a high market value all over the European Union and beyond. Talent Fostering There is an excessive demand for admission to the Faculty every year, and a large number of gifted students enrol, who have already achieved success at high school scientific competitions. Talented students are rapidly integrated into research projects under the guidance of dedicated supervisors, and take part in student research conferences at the University, as well as at national and international levels. These students often proceed to Ph.D. Schooland. 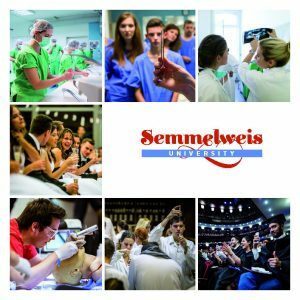 Career Opportunities Graduates of Semmelweis University’s Pharmacy programme have numerous career opportunities to choose form. Whether these professional pharmacists decide to seek employment in public or hospital pharmacies, the pharmaceutical industry, health authorities, regulatory agencies, or academia, statistics show that they generally obtain their desired job within 21 days of graduation. Research, Development and Innovation The Faculty of Pharmacy has been a research-oriented unit of higher education ever since its foundation. Research is done by all 6 departments of the Faculty closely cooperating with Hungarian pharmaceutical companies, academic research groups and other research groups of Hungarian and international universities. The Faculty’s research portfolio includes the design, synthesis, isolation, structure identification and structure examination of potential drug molecules. Furthermore, in vitro and in vivo pharmacologial methods, pharmacokinetics and pharmacometabolic examinations, drug safety tests and new therapeutic application of drugs are researched. The Faculty has considerable experience in the research and development of organic and synthetic substances, their interaction with biomolecules, the development of innovative drugs used in peronlised theraphies and the non-invasive extraction of moleacular information from human resources. Research work is based upon state-of-the-art instrumentation, including a 600 MHz nuclear magnetic resonance spectrometer, mass spectrometers, various hyphenated separation instruments, animal facilities, library, and computational platforms, and are supported by national and European funds. International Relations The Faculty is involved in several international collaborations in research and education, both in Europe and overseas. Today especially strong ties exist with the University of California, the Catholic University of Leuven, and Imperial College, London. Highlight of Accomplishments The Nobel laureate János Harsányi received his Pharmacy diploma from the Faculty, two original drug molecules (deprenyl and vinpocetin) were discovered with the participation of the Faculty’s professors, and several new pharmacy-related, species-specific physicochemical parameters have been introduced, developed and utilised here, just to name a few of the Faculty’s noteworthy accomplishments.